To create raked theatre seating in wysiwyg, you create one line of chairs and then manually copy and paste them in a raked pattern using the Array tool. Note: This procedure simulates raked seating by angling all the chairs upward in consecutive rows. However, the seats of the chairs will all be at a slight angle. To reproduce the exact seating that you have in your venue, you would have to create a series of steps (risers), and then manually place the rows of chairs upon them. In CAD mode, on the Wireframe tab, open an existing file that contains a venue, such as a black box or a proscenium arch (or create a new venue from scratch). Note: In this example, a proscenium arch is used. If you are using a different venue, you will have to adjust the values shown. Click the Plan View icon. Click Library > Browse Library to open the Library Browser. In the Library Browser, on the Library tab, under Objects, double-click Seating > Chairs > Office > Straight Back Chair 01. Click at the front of your venue on one of its sides to place the first chair in the front row, and then right-click and choose Finish Library Item. a. Click the chair to select it and then right-click and choose Rotate. b. Click on the center square of the chair and then drag the chair around to face the front. Click the chair to select it, and then right-click and select Tools > Array > Linear. Draw a selection box around all the seats to select them at once. Press Ctrl + G to group them together as a single object. Click on the row to select it, and then right-click and select Tools > Array > Linear. Move your cursor in the direction in which you want the row of chairs to be aligned, in this case, toward the back of the venue, and click. Ensure that there is a straight line between the first row of chairs and the place where you click. 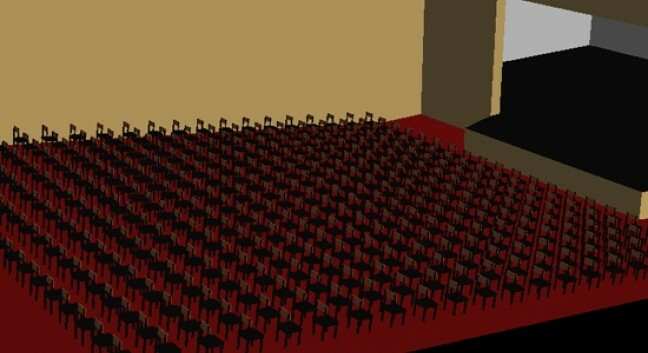 Draw a selection box around all the rows of chairs to select them at once, and then press Ctrl + G to group them together as a single object. Click either of the side view icons, Left or Right. Click the line of chairs to select it and then right-click and select Rotate. Click in the middle of the line of chairs.